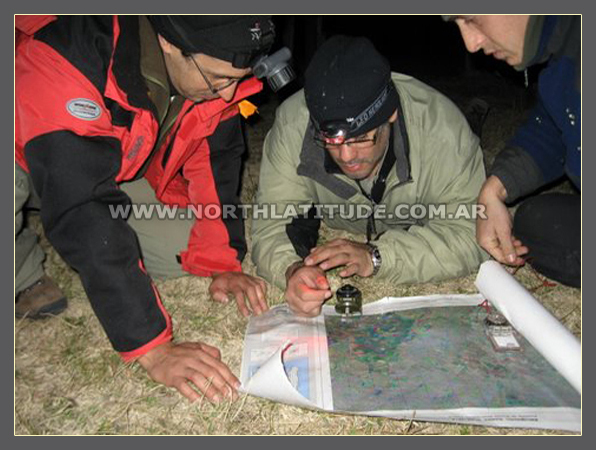 In this article you will know some basic definitions about the Orienteering and Land Navigation techniques, those that need to be carried out in different natural environments comprised by a wild geography covered by countryside’s, woodlands, mountains, deserts, ice and glaciers, among others, which it gathers a vital importance for whose in one way or other interact in these type of terrains, mostly located far away from the cities. 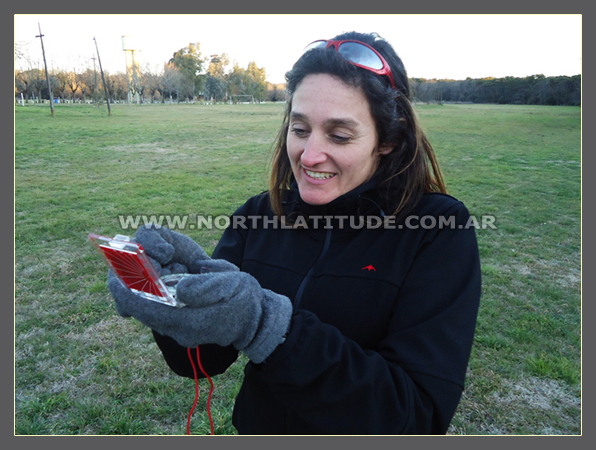 My recommendation is that once you´ve finished reading this article, understand the message because it will be for your own benefit, for example, to know how to get oriented in unknown natural places using a magnetic compass and a navigation map that will allow you not only to walk on trails, circuits or others in order to arrive safely and in time to the end of an adventure race, in a mountain expedition, following routes in natural places using a bike, a 4x4 vehicle, carrying out a trekking with your backpack, looking for a recreation time to be disconnected from the duties of the city, etc, if not that having the essential to be oriented, this minimum skills will allow you to be safe or save other lives when for example, you are in the middle of a real survival situation in the wilderness. Those individuals who practice sporting activities or alike in the outdoor in any natural wild places need to naturally add certain skills to the sport discipline, competitive or other they develop to improve their amateur, intermediate or professional education and in this way, make a much better performance when going to terrains like mountains, hills, woodlands, deserts or simply, when carrying their backpack to go and get into non explored or unknown places. And all this is to be able of carrying out a journey in the ground (the own land navigation) and in this way, to cover distances which can be comprised by hundreds of meters or kilometers of plain terrains with the possible presence of vegetation with greater or lesser amount or on hills or mountains where to walk on this type of terrains, you will have to deal with the presence of the third dimension (the different altitudes) that in topography is what we call to know the terrain by the conformation of its diverse altitudes. For example, for the practice of the disciplines of Trekking, Mountaineering, Adventure races, Biking or other alike, it is not only required that the adventurer, the amateur or skilled sport man get and base education in their psychologist, physical and spiritual to carry out those activities in the outdoor if not, it would be ideal that they expand their professional abilities by means of the learning of the orienteering with primary techniques to know in which place someone is found as much in the terrain as in the navigation map (their physical or virtual position) and know where to head by making measures of the bearing to follow (direction) and the distance to cover, time of walking, etc. The importance this theoretical and practical knowledge meets to know how to get oriented through a course in the matter is very essential, particularly for those who move in the outdoor as formerly aforementioned. You must understand the importance of these at the time you start in the outdoor when you carry out a journey, a camping, when you are in the middle of a survival situation, etc. The orienteering in the ground will be made by means of two main essential elements for this kind of activity, basically represented by an instrument for the navigation known as “compass” and a “topographic map” and/or other auxiliary means necessary to be used when you don´t have the first two ones although you can complement it with a “GPS satellite navigator”. Before you plan your land navigation (by designing a journey drawn on your navigation map to use this information on the terrain later on), you as orienteer must in the first place, align the north point of the map (coordinates) with the north of the compass (magnetic north) in order to be well oriented on the terrain and later begin with the map reading with the objective of analyzing what to do along with a suitable key decisions to be made and thus, to be able in situation of to plan a strategy about how to move on the ground, having into account certain additional information as its features as for example, the presence of mountains (and the importance of the contour levels that show altitudes), woodlands or others. A topographic map bring printed information of great value for the user because it provides topographic data comprised mainly by planimetry and altimetry, among others, those that will be of great usefulness to know not only the position of the orienteer regarding to their geographic position he occupy on the terrain (for example, if someone is a mountain at 3,500 mts. high), if not, to know detailed information about the geographic data it provides about those natural and artificial elements located around you, in the proximities that might be around a few one hundred meters or kilometers, something very important to know with physical elements you will find when you start your travel. It also very important to know the scale of the map because it provides two types of scales, one numeric and the other graphic which for some outdoor activities and especially for those for mountaineering, the map of 1:50.000 are most used (especially in Argentine, my country), term that can be written in a divided way but that in one word, it is the same. For years, the world and particularly our country in view of its extensive geography and natural wealth used mostly as advantage to practice sports, etc, there has been using a new way to be oriented and navigate which expressly go hand in hand with the technology is a hand-held electronic device that once you turn it on from anywhere from the terrestrial surface, it begins to interact in real time with some space satellite from a series of 24 of them, geographically located around the planet earth. All of them are positioned in diverse space orbits around the earth and located at an altitude of 20,200 kms. away from the earth. When I do refer to that device it is because in fact it is a satellite receiver, mostly know by his universal initial as GPS (Global Positioning System) that in fact, this GPS initial is referred to the space distribution of the aforementioned satellite. This personal navigator brings on his frontal structure a display which one turn one, it provides information in real time about the geographic position it is on anywhere of the ground or in other words, in which geographic point of the world one person is standing with a GPS receiver where besides, depending on which place of the earth you are. For example, in Argentine we are geographically located in the Western Hemisphere or Occidental (with respect to the Greenwich meridian) and South Hemisphere or Austral south (with respect with the Ecuador parallel). 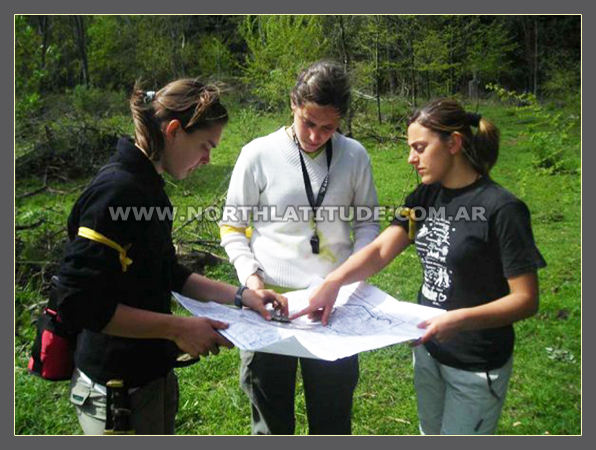 About both ways of orienteering (basically with a compass and a topographic map along with a GPS as well), it is fundamental to give importance to the traditional and primary learning of the use of a compass and map reading before learning about how to used the satellite navigator, ever if you have the opportunity to choose and be skilled using a compass and a map and why that? Well, it is because as a GPS satellite receiver is a very important technology element to generally navigate in the outdoor, it may happen for some reasons or circumstances is don´t work very well or directly it don´t work at all and if we only have a GPS to navigate and don´t have a compass and a topographic map, we literally stay without information to get oriented to move and follow a determined direction, ever depending on the activity you are carrying out. 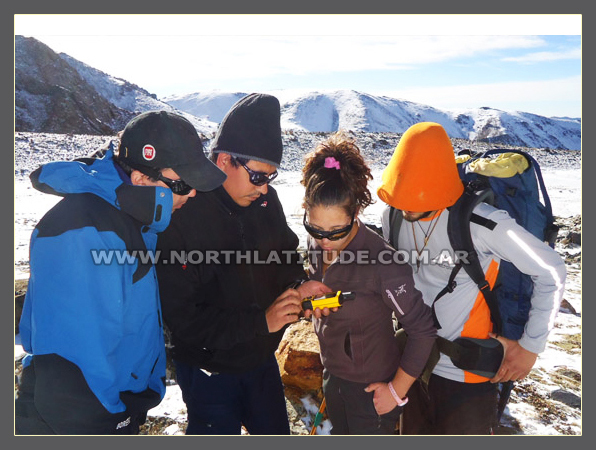 For that, it is advisable that is very essential the combined learning of the aforementioned elements (compass and map) although you don´t have to reject the important value that a GPS offers. Si un grupo de personas se encuentra en una expedición de alta montaña, localizados a varios miles de metros de altura y posteriormente de haber llegado a la cumbre de una montaña desean regresar y descender hacia el campamento de altura donde hicieron base por la misma ruta de ascenso y que por razones de mal tiempo u otra circunstancia no puedan regresar por el mismo lugar que lo hicieron, podrían leer su carta de navegación del lugar y diseñar la travesía de regreso usando una brújula pero, ello se supone cuando las condiciones climáticas del lugar son duras. Recuerdo una anécdota no propia pero que pertenece a un amigo, un guía de montaña mendocino quien me comentó que junto a unos amigos se encontraban en una expedición en alta montaña en el Cordón del Plata, en Vallecitos, Pcia. de Mendoza, Argentina y que después de haber llegado a la cumbre del cerro Plata de aproximadamente 6.000 mts. de altura, al descender el mal tiempo los sorprendió y no tenían buena visión espacial a la distancia, obligándolos a tomar una nueva decisión. Varios de ellos comenzaron a decir que habían ascendido por un lugar, otros por otro lado y así hasta que el guía de montaña, un amigo experimentado en la materia orientación les indicó que iban a regresar siguiendo el contra rumbo de la brújula y que debían confiar en este importante elemento instrumental de navegación y así fue que llegaron bien a destino. También tengo una experiencia propia del mismo lugar geográfico ocurrida hace unos años atrás ya que era mi tercera expedición en el Cordón del Plata, cuando intentamos llegar a una cumbre de un cerro de 5.000 mts. pero que lamentablemente, el clima no fue el mejor y de pronto, cuando estábamos entre los 3.500 o 3.800 mts. de altura, nos encontramos envueltos en una nube y después de unas horas de descenso tranquilo (porque era la primera vez que intentábamos ese cerro), aunque disponía de una brújula, entre todos comenzamos el descenso siguiendo la sinuosidad del terreno, bordeando un arroyo hasta que encontramos nuestro campamento. Quien se encuentre utilizando una carta topográfica y una brújula y esté desplazándose en un terreno, se le llama "navegante terrestre" como en España por ejemplo, a algunos lo llaman “Orientadores”. Es fundamental saber este concepto pero es importante saber que una persona que haya finalizado un curso de Orientación, Navegación Terrestre y GPS, no se convierte en breve tiempo en un experimentado en la materia, al contrario, se requiere de mucha práctica en el terreno, situación que con el tiempo esa práctica del arte de las técnicas mencionadas lo dotará de habilidades y confianza propias y necesarias para desenvolverse seguramente en el lugar natural en que se encuentre, por voluntad propia o circunstancial. Vale aclarar que generalmente, lo que uno aprende en Orientación es un conocimiento adquirido pero así mismo, hay personas que ya poseen un conocimiento innato y que a través de la práctica se percibe su buen desenvolvimiento. Cartography. Cartografia. Se la define como aquella rama de las ciencias geográficas que por medio de un mapa o carta topográfica se muestra en una representación plana, reducida y aproximada, un sector de la superficie terrestre. Se debe interpretar que una parte de un mundo curvo y tridimensional (3D) –dependiendo de la escala de la carta-. se encuentra simbolizado en una superficie plana de dos dimensiones (2D), precisamente con datos topográficos. Compass. Instrumento de orientación que utiliza una aguja imantada para señalar el norte magnético terrestre, cuyo funcionamiento se basa en que la aguja se encuentra inserta dentro del campo magnético terrestre, por lo que señala el norte magnético y no al norte geográfico. Orientation. Significa determinar en el terreno la dirección oriente (Este) y a partir de ahí conocer espacialmente los demás puntos cardinales". Land Navigation. Es aquel método empírico que empleamos para desplazarnos desde un lugar a otro, utilizando como guía los puntos característicos del terreno en que se encuentre y conociendo siempre la ubicación geográfica tanto en la carta como el terreno.